Magnolia Mamas : Children's Book Club: Shark Attack! It's Shark Week, and our kids are obsessed! Every time we turn around they are turning on the Discovery Channel to see what sharks are terrorizing swimming the ocean waters at that moment. Sharks are serious business year round in this house though, and through some of our summer adventures, it seems like the excitement about those toothy sea creatures has been amplified. Cute came home from our family vacation, and wanted to read anything and everything about sharks. From fiction to non-fiction he soaks up every. single. word. Now I know way more about sharks than I ever wanted to in my life. You might find us sticking to pools from now on. We got our shark loving little boys (and girls!) together and asked them to pick their favorite shark themed books. They were so excited about this task and made sure to pick the "very best and baddest" shark books. Sharks Discovery Kids - This is one of our favorites! It has realistic photos, tons of great facts, and a peek at a variety of different sharks that are swimming in the ocean. The Shark Who Learned a Lessson - This story follows Shadow the Shark, who sadly has become the ocean bully. The creatures of the ocean ban together and show Shadow a different way to be. Clark the Shark - This is the original in the "Clark the Shark" series. Clark is a rambunctious little shark just trying to fit in at school. The series follows the lessons that Clark has to learn along the way. Great for any young school aged child! Nugget & Fang - Nugget and Fang are the best of friends. Nugget goes to school and finds that his best friend is a little different. A great book to show young children even though we are all different we can all be friends. Finn Flips - Finn is a shark with lots of pep in his fins, but when he flips, all his ocean friends at Club Shark better watch out! A fun little story our early readers love! Hark! A Shark! - A rhyming shark book from our favorite Dr. Suess character - the Cat in the Hat. This is a fun little book to teach shark loving little ones facts about their favorite ocean creatures. Wild Kratts: Sharks, Whales & Dolphins! - Our favorite animal loving duo share all about sharks, and some of the larger creatures they share the ocean with. A great way to show how sharks interact with their oceanic neighbors. If Sharks Disappeared - A great way to further the conversation of why we can't get rid of sharks even if they are sometimes scary. Shark Lady - This new to us story has quickly become a favorite of all of our kids. This follows the true story of Eugenie Clark, one of the world's greatest shark loving scientists. A fun story and lots of great facts. 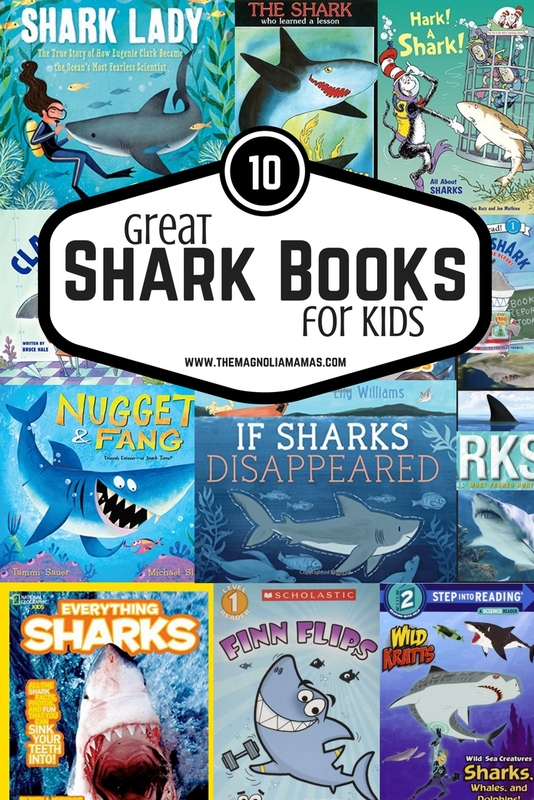 National Geographic Kids Everything Sharks - Part fact book and part activity book this is one of our shark loving little ones favorite shark books. It's great book for car rides and restaurant entertainment. The are tons of great shark books for kids out there, but hopefully this list has narrowed it down for you! And because it just happens to be "Shark Week" we are going to extend the shark filled fun by giving away one of our favorite shark tales. Pop over to Instagram to win your own copy of The Shark Who Learned a Lesson from Hawaiian children's book author Gil McBarnet. The giveaway will go live later today and the winner will be announced Sunday, July 30th.